There are many toys on the market today that promise to teach kids programming skills, and a good percentage require the use of a connected tablet or smartphone. At a time when parents are already struggling to keep kids’ screen time to a minimum, father and entrepreneur Nader Hamda wanted to build something different. He also observed a lot of expensive educational toys on the market, and wanted to create an affordable alternative to reach a broad population of schools and students. His creation, the Ozobot, is a line of toy robots about the size of a golf ball that follow lines that kids draw with markers on white paper. Kids can use different colors to change the Ozobot’s movement or behavior. The toy robots can work offline, but can also be controlled by an Ozobot mobile app, where kids also learn to write programs that they can later send to each other by text message. When they send each other one of these programs, it controls the recipient’s nearby Ozobot. The company’s starter kit costs about $60. The toys are sold online directly by Ozobot, or through major brick and mortar retailers, including Barnes & Noble and Toys “R” Us. They will soon be available at Best Buy and Target, Hamda says. More than half a million Ozobots have been sold to kids, families and educators. That’s including the original Ozobot, Bit and newer Evo edition Ozobots. The Ozobot Evo in white. Hamda’s Redondo Beach, Calif. startup, incorporated as Evollve Inc., has recently secured $3 million in Series A venture funding to ramp up production of the Ozobot, and to develop new features and content to reach even more kids in the U.S., France and South Korea. Tribeca Venture Partners led the Series A investment in Ozobot, joined by unnamed venture firms and angel investors, including ZICO coconut water founder Mark Rampolla. Rampolla said Ozobot has a chance to create a new category within edtech, much the way ZICO helped create a new beverage category. By this time, there are more than 80 coconut water brands sold at groceries in the U.S., he noted. Back when he started, ZICO was the only one available nationally. The category that’s shaping up here, as he sees it, has to do with affordable educational hardware that can grow along with students’ skills. 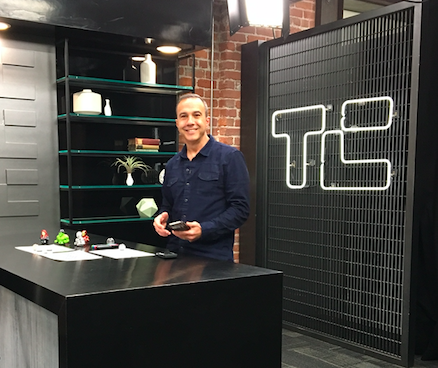 Ozobot CEO Nader Hamda at TechCrunch in San Francisco. Some of the new Ozobot features in the works will allow the “smart social robots” to respond to one another, so students can build robotic “swarms” that collaborate and are programmed to take action together, the CEO said. Ozobot is also developing more classroom-ready curriculum for educators who want to put the device to use in their classroom. Educators often reach out to Evollve to share the lessons they’ve created using Ozobots. One favorite example Hamda said he’s seen so far came from a biology teacher who asked kids to program Ozobots to circulate through drawings of the human digestive system as food would circulate when a person eats it. One thing helping to fuel Ozobot’s growth is a licensing tie-in with Disney’s Marvel Avengers. The company sells toppers kids can affix to their robots, changing the way the Ozobot sounds and moves when attached. Popular characters include Iron Man and Captain America. Ozobot will offer Black Widow, Ultron and The Hulk characters this year, as well. Tribeca Venture Partners’ co-founder and Managing Director Brian Hirsch tells TechCrunch his firm, which does not typically back consumer hardware startups, invested in Ozobot in part because of the massive market opportunity it’s tapping into. Gartner predicts that smart toy sales will grow globally from 8 million units this year to 421 million units by 2020, the investor said. Juniper research forecasts that worldwide sales of smart toys will balloon to $11.2 billion by 2020. Ozobot competes with a bevy of smart-toy brands, from the makers of Dash & Dot to the Anki Cozmo, to Bots_alive and Osmo. But, Hirsch suggests, this isn’t a “winner take all” market. Thinking back on all the great toy brands that the 80s yielded, from Transformers to Speak and Spell, or to something more contemporary like Minecraft, it’s not hard to see several big winners in this space.